This heavy-duty sheet pan rack by Gridmann is made from16 gauge steel and is perfect for use in any kitchen, bakery, cafeteria, or pizzeria, and is great for saving space in tight kitchens and transporting food between locations. This rack loads from both front and back sides, is lightweight and easy to move around, and has tray slides firmly welded to frame posts. It also features rubber-coated 5"swivel casters; 2 with locking brakes. Height between pan slides: 3". 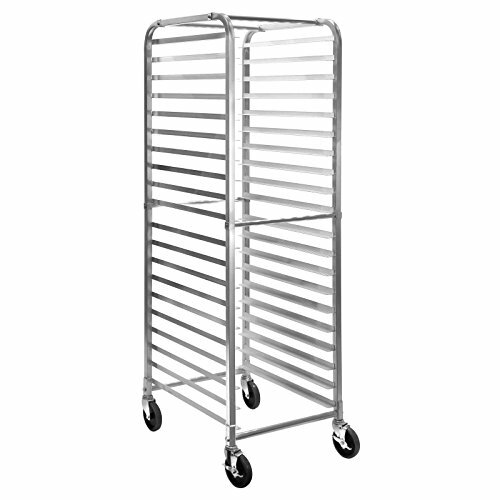 20-Pan rack: 26-1/8" long, 20-3/8" wide, 69" tall. Capacity of (20) full-size 18" x 26" sheet pans or (40) half-size 18" x 13" pans. Six cross support bars for stability. What"s included: Pan rack with wheels as described, instructions, and hardware for assembly (wrench required for setup). Gridmann Stainless Steel Commercial Kitchen Prep & Work Table w/ Backsplash - 30" x 24"